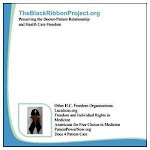 Docs 4 Patient Care is an active, reputable physician's group working hard to promote health care freedom. I have personally talked with a number of the board members. They are hard working, honest individuals dedicated to providing quality care to their patients and restoring independence and freedom to medical decision making. Please check them out and provide them support. My son thinks the following YouTube clip is "scaremongering" similar to the tactics of the global warming alarmists. Perhaps he is right about the tone and the style of message--but the major difference I see is that Dr. Scherz is correct in stating that socialized medicine increases pain, suffering and death. That statement is not conjecture but fact. Do we still believe in individual rights, freedom and limited government, or do we submit to the directives and central planning of the political elite? "Any health care funding plan that is just, equitable, civilized and humane must, must, redistribute wealth from the richer among us to the poorer and the less fortunate. Excellent health care is by definition redistributional."